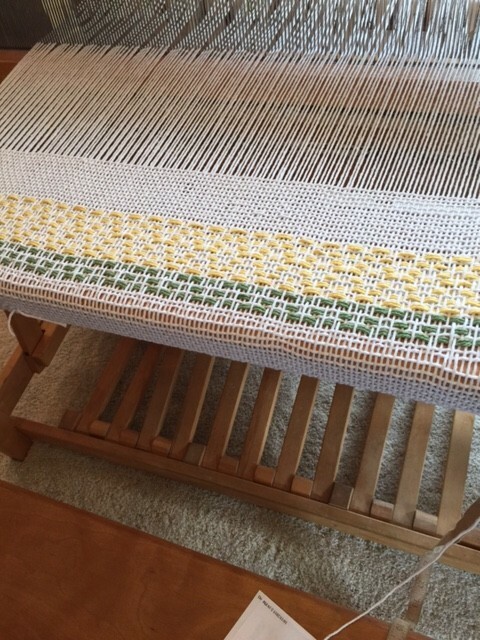 I am playing with my “new-to-me” Gilmore floor loom this weekend. It has 8 shafts, but I am only using 4. 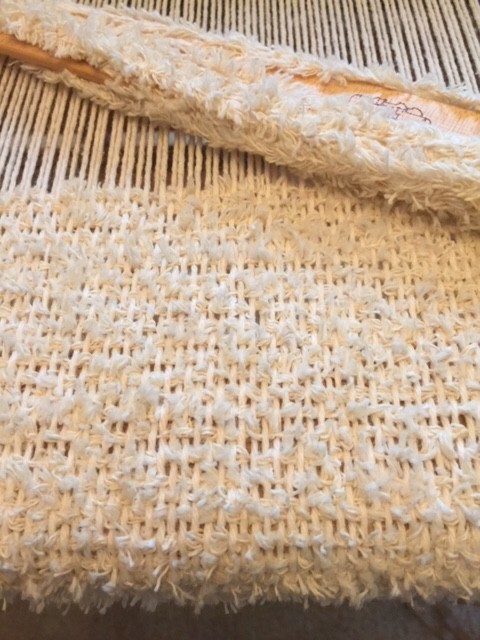 I bought worsted weight Sugar and Cream cotton in a bunch of colors, and warped from back to front, as you are supposed to with a separator beam. I didn’t like it much, there has to be a better way to do this. I put on a Rosepath threading, and used a few treadling tie-ups and drafts to make “pictures”. It was fun, and mildly successful. 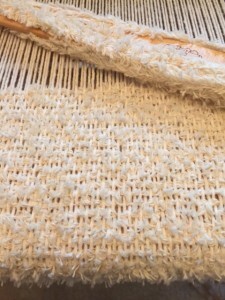 We will see after washing – when the fibers settle into place. I put on a second warp, going from front to back, this time. It came out beautifully! 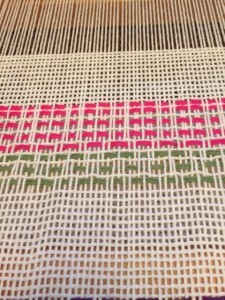 Then I sat down to weave and couldn’t get a proper shed. I checked the tie-ups. I checked the heddles. All OK. 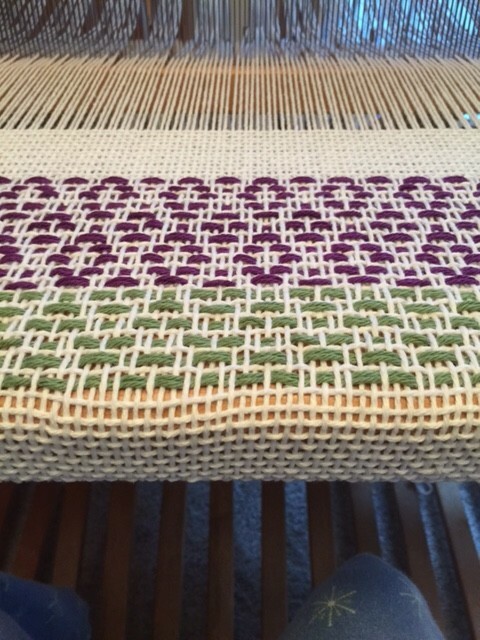 So I went to my oracle, Deborah Chandler’s “Learning to Weave”. Under “can’t get a shed” – she says (honest to God) “You forgot to put up the back beam before winding the warp”. 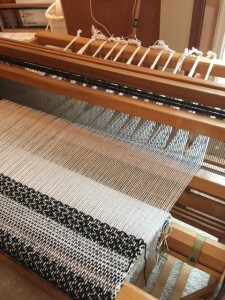 I went to the loom to look, and of course that was it. Thank you, Deborah! I had to unwind, put the beam back, and wind it again, so it isn’t as pretty as the first try. But it works. 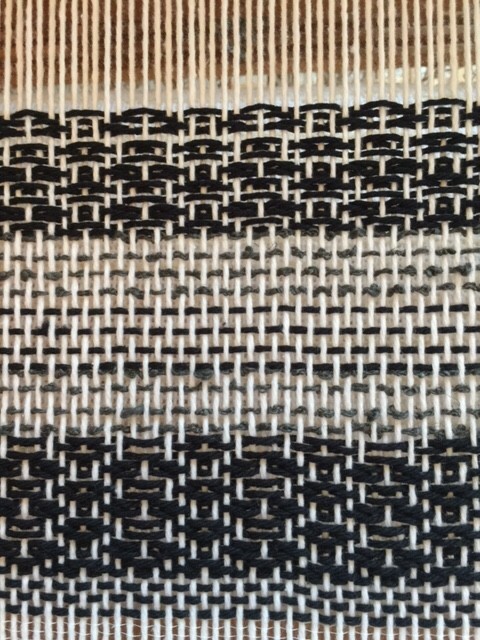 The weft is a Muppet yarn that Laura Farson gave me when I started to weave. 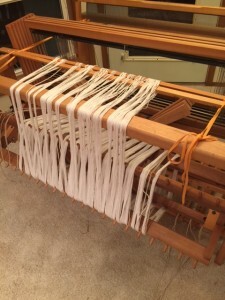 I am making mats for the loom bench and my piano bench. Jasmine thinks I am making cat beds, and that works for me, too. 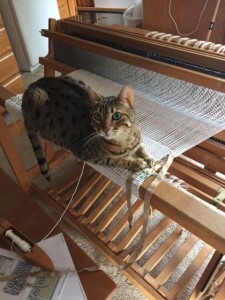 Anything to get her off the actual loom! I turn my back, and Jasmine got up on the front beam! Seriously? Is that a comfy spot? 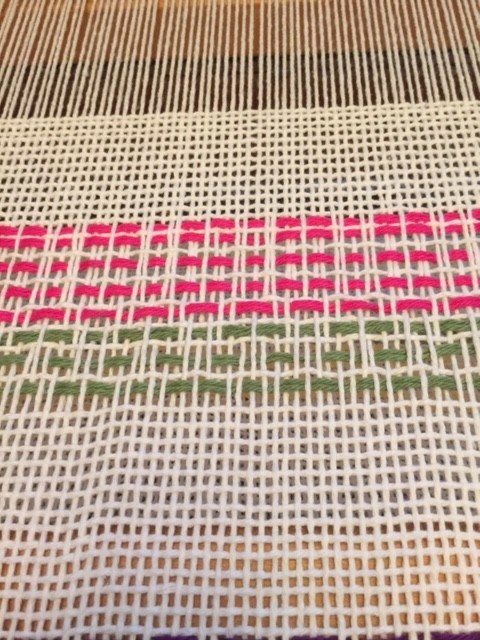 finishing the warp! 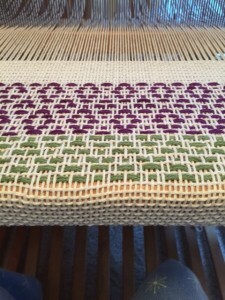 First finished cloth from the Gilmore floor loom. 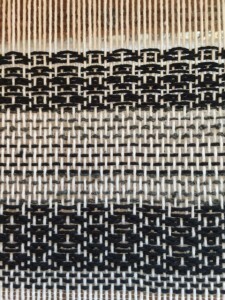 The black cotton is Sugar and cream, the gray is scrap boucle. 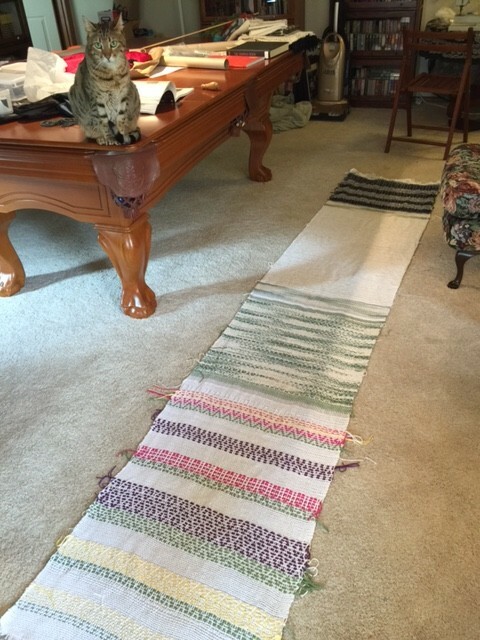 Pattern is Rosepath, and I threw some Plain weave stripes in there, too. These are supposed to be tulips. Hmm. We will see, after finishing. This is “Lavendar”. I can see this one, if I squint! 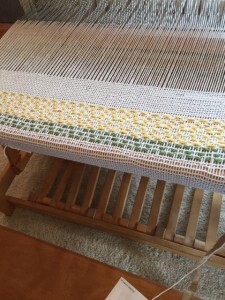 Jasmine was lying on this, which is the “Daisy” treadling. 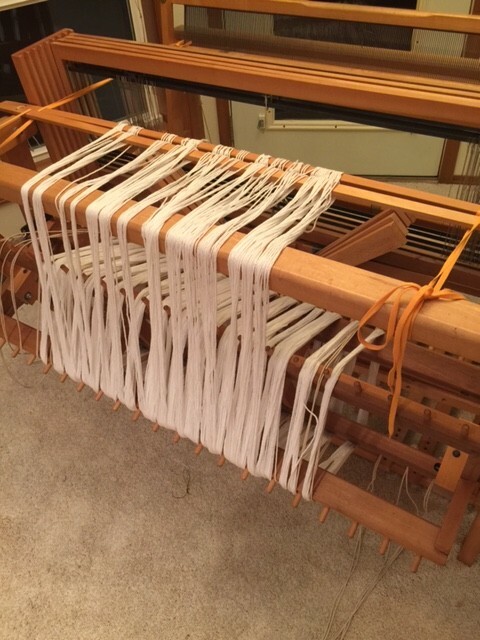 First warp – done back to front. This is suggested for a separator beam, but I don’t like it as well as front to back.